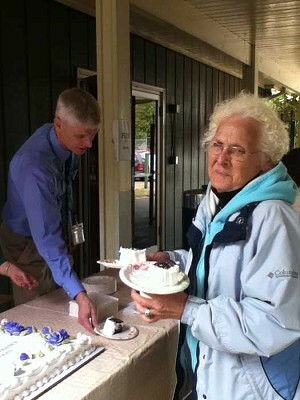 Alma Stafford picks up cake at Catholic Community Services, Springfield. SPRINGFIELD — Since 1952, Catholic Community Services of Lane County has been quietly doing some of the most important work on the planet — helping distressed families meet their basic needs and build a better future. It's part of following the gospel, says Tom Mulhern, the non-profit agency's executive director. The 60th anniversary comes as Pope Benedict called for a Year of Faith. That confluence is not lost on Mulhern, who since he took the post a year ago has been trying to re-establish his agency's Catholic identity. "Helping people in the pews put faith into action — that's what we're all about," says Mulhern, a member of St. Paul Parish in Eugene. The agency, which distributes more than 20 percent of the donated food collected by Food for Lane County, serves more than 23,000 low-income people each year. In addition to food, Catholic Community Services is part of the region's social safety net, distributing donated clothing, hygiene and household items. Staff help families make the transition from homelessness to permanent housing and give assistance in paying utility bills. Other workers assist households in providing a safe and stable home for children or teach young fathers learn how to become better parents and providers. Catholic Community Services has centers in Eugene and Springfield. To celebrate the anniversary, staff served up free cake last week. "They are very dedicated to the Catholic mission of helping those in need," says Dianne Bert, retired principal of O'Hara School and a Catholic Community Services board member. "They are a humble, sincere, committed group of people who really do care." Bert says she admires that the agency serves immediate needs and works on future-oriented anti-poverty goals. Mulhern hopes to increase the programs that focus on the long term. Mulhern, who has surveyed local priests and Catholics, took the job just after the Archdiocese of Portland decided that Catholic Community Services should refuse money from United Way, which also funds Planned Parenthood. The move, though applauded by many Catholics, meant the agency had to fill a hole of $80,000. There was also a cut in government aid of 10 times that. The agency's annual budget is $3.6 million. Mulhern calls the United Way decision "a defining moment for this organization." Catholic Community Services was established by Msgr. Edmund Murnane, a priest legendary in Lane County for beginning parishes, schools, a convent and several social service outlets.